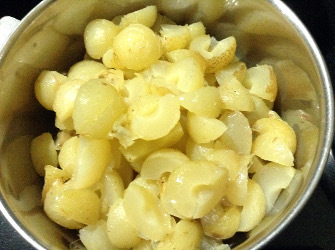 You will find step by step pictures of making Indian Amla murabba or gooseberry moramba here. 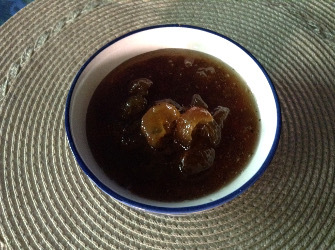 Amla/gooseberry murabba is a winter special recipe when gooseberries are available in plenty. 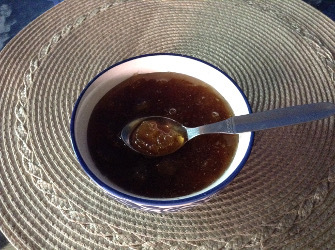 Murabba is a Hindi word which means 'relish made with fruits'. Amla / gooseberries provide us vitamin C and are a treasure of nutrients needed for good health and to improve immunity. This amla murabba keep long and you can serve it with chapati, poori, paratha or eat by itself. Eating an amla in the morning helps in improving digestion and in keeping stomach acidity in control. You may leave the seeds intact but I prefer to remove the seeds and for that I steam amla or pressure cook them for one whistle. 1. 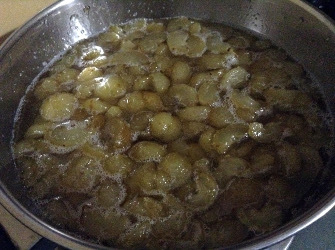 Wash the amla well and dry them throughly. Today, I pressure cooked amla and then I let the pressure cooker cool itself. When I opened the cooker, amla has opened up and it is very easy to remove seeds. Below you can see after I have removed all seeds from the amla/gooseberry. 2. I added these deseeded amla in a stainless steel kadai. Added sugar on top and mixed a little. Kept aside for 2-3 hours while I attended to some other work. 3. 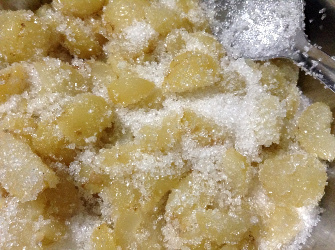 After 3 hours, sugar has almost melted and this is how the amla sugar mixture looked - See the image below. Now I keep the kadai on the stove on low flame. 4. I stir the mixture and let the remaining sugar at the bottom melt. I continue cooking till mixture thickens a little which takes about 10-15 minutes. 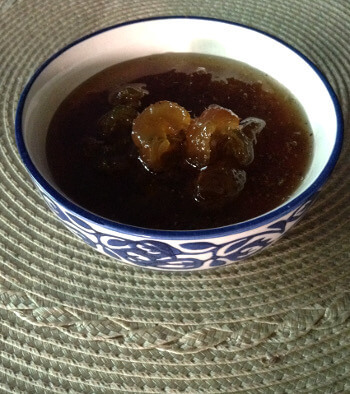 Amla pieces have absorbed some sugar sweetness and the sugar syrup has got some amla flavor and taste by this time. 5. I switched off the flame and let amla murabba cool a little. 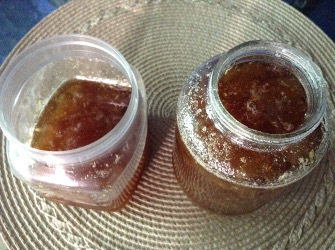 I divided the amla murabba in two bottles as I wanted to add different flavors. 6. I added some cardamom powder for flavor to one bottle. 7. I added 1/4 tsp black pepper powder, 1/4 tsp black/rock salt to amla murabba in another bottle because I like it that way but it is not a must. 8. 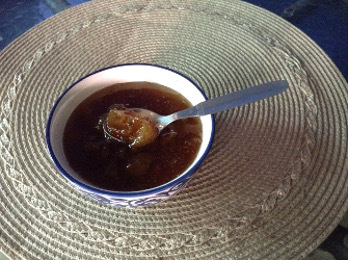 Now is the time to cool this amla morabba completely and then close the bottles. Now we can enjoy amla gooseberry murabba everyday. You may keep amla whole if you wish. In that case, prick each amla with a toothpick so that it will absorb the sugar syrup well. I prefer to remove seeds. 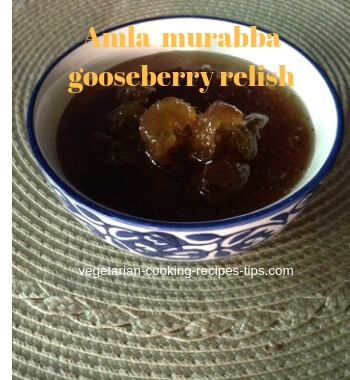 You may steam or pressure cook amla / gooseberries, even when you want to keep them whole.